You are here: Home / Other Pets / Do Mothballs Repel Skunks? Get a Skunk to Leave IMMEDIATELY! Does Ammonia Keep Skunks away? How do You Get a Skunk to Leave? Of all the critters many backyard chicken and garden owners do not like to see, the skunk is among the “Most Un-Wanted”. Repellents such as ammonias can be used to eradicate them, but here comes the true question, do mothballs repel skunks? Find out in the article below. Skunks from afar look cute but these nocturnal mammals can really stink up the joint, they can also make off with your best produce under the cover. It’s no wonder gardeners are always looking for methods on how to use mothballs to get rid of skunk. Most people also repel them from their vicinity because of they are a primary carrier of the deadly rabies virus. They also make a mess with farms/yards and garbage, digging cone-shaped holes as they search for grub to feed on. Because of this, plenty formulated skunk repellants as well as DIY instructions are now available to interested buyers. Like most other repellents used for wildlife animals, these repellents are aimed at the skunk’s sense of smell. When it works, repellents save homeowners the cost of repairing facilities and also, keeps the risk of zoonotic diseases at bay. The active ingredient is a white solid substance with a strong smell called Napthalene. Many animals cannot stand the smell and would retreat, at least for a certain period of time. The white balls are thrown inside its hole or close to the skunk’s hideout. Mothballs and Napthalene contain organic compound that is rather toxic for the environment and can be harmful to humans as well. In fact, too much handling of it could predispose an individual to cancer. Mothballs are almost the go-to-cure for the world’s cure for almost everything pest animal related. Not only will moth balls get rid of rats, they will deter mice, drive squirrels away, turn around armadillos, stop snakes, and chase off raccoons. Now that you are aware of the cool things these little, toxic balls do, you might begin to see how stupid it is to think that they will work all the time for everything. In real fact, the only thing moth balls are primarily good for is killing moth larvae. Originally, this was what the product was designed for. So, Do mothballs repel skunks, really? The answer is YES! However, if you decide to use, keep in mind that the little white balls are made of a known carcinogen. This means they cause cancer in people and lab rats. If that doesn’t turn you away from using them, consider the fact that the toxic level of moth ball fumes for a skunk is also the toxic level for a human. The skunk won’t be able to live in the house, but neither will you (it gets more dangerous if you have little children around). Do not bother using moth balls outside, as the fumes will be lost on the winds. The outdoors is too large for mothballs to be in any way effective. It is hugely believed to repel a large number of wildlife due to its strong smell. The mode of application involves placing old rags dipped in ammonia anywhere skunk activity has been observed or under your porch or deck. Ammonia is really distressing to the nose and eyes of wildlife and has a better chance at being effective when applied in an enclosed space/area. Although it would need to be re-applied from time to time. Of all working repellent substances you can find around, the most common are ammonia and mothballs. They are believed to deter skunks because of their stinging fumes and strong smell. But how successful are these materials really, in repelling the furry mammal? Keeping skunk away is beyond the power and scope as the struggle is real for these animals and almost always find a way around these repellents when given time. The most effective way to deter skunk is to take away all attractants and build structures to keep them off your premise. If you already have a skunk neighbor, humanely remove them with live traps and carry out repairs to block points to your property. You may want to hire a wildlife professional to skunk-proof your house. By nature, skunks are skittish, shy creatures, so if one finds its way into your yard, chances are good it’s got a meal reason to be there: i.e food. Want to know what attracts skunks? Food! Is your thrash container securely covered? Is an open compost pile, bird feeder, or pet food attracting the skunks? Veggies and Fruits in your garden can act as skunk bait, so try building a fence that surrounds your crops. The skunks won’t be able to climb over, but an hunger-motivated critter can dig under a fence, so consider burying several inches of fence or sprinkling chilli or cayenne powder around the fence perimeter to act as a deterrent. Skunks are night-dwelling animals, and do not like bright light. A motion-activated flood lamp will often startle them off your property. 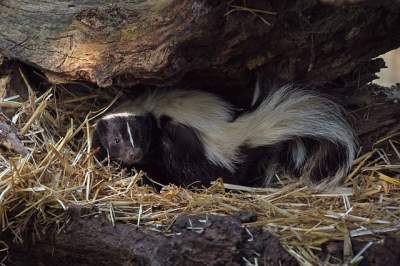 I know it sounds ironic, but skunks hate certain odors (as if they have room to judge). Ammonia, Citrus, mothballs and predator urine (dog, coyote, etc.) 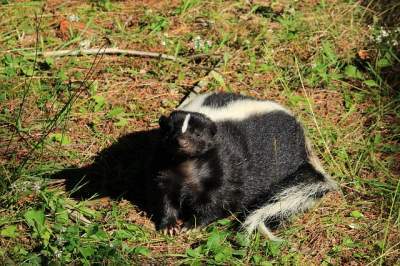 are three smells that can scare off skunks. If you use ammonia-soaked cotton balls or mothballs, be sure to keep them far away from children. Once you discover where the skunk lives, you can fill up its hole with dirt. Just be careful in spring, when the skunk may have babies in her den! Optionally, you can try live trapping skunks, and then remove it to another natural area. Too skittish to go head-to-head with a persistent skunk? Try the phone book. Search under wildlife control or pest control online or in the yellow pages. Sometimes, it’s just best to leave delicate jobs to the experts.